No, they are not klingon. Oh tasty, tasty little nut filled crescents wrapped in a cream cheese dough. These are traditionally jewish, it wouldn’t be the first delectable food they have given us either. I tend to pronounce these rugalah, no idea how right that is but who cares once you have eaten your fill of these delicious delights. They look really impressive when you serve them but really they only take a few more steps than making those pilsbury crescent thingies. Definitely a win/win. My grandmother used to make a version of these for the holidays filled with hazelnuts or sometimes almonds. The filling is always changeable, it’s the crescent shape and the dough that are mainstays. Combine the flours in a bowl. In another bowl beat the ricotta, cream cheese, splenda, and butter at high speed until light and fluffy, about 3 minutes. Add the flour mixture, stirring by hand, mix until a dough forms. Divide the dough in half and shape into a flat disk. Don’t play deadly disc with it…it’s too tasty. Wrap each with plastic wrap and freeze for about 20-30 minutes. It should be firm. Combine the brown sugar, pistachios, and cinnamon in a small bowl. Roll out your first disk into an 11 inch round. Sprinkle half of the cinnamon mixture over the dough. Top with half of the cranberries. Press the topping into the dough using the palm of your hand. Using a knife cut the dough into wedges like you would a cake or pie, diagonally. You want 16 wedges. Starting at the outer edge of each wedge, carefully roll the dough to form a crescent. How curved you want your crescent is completely up to you. My grandmother liked to pinch the ends to keep the filling inside. Open or closed both are tasty. Place on a lined baking sheet. Repeat with the second disc. Bake at 350F for 25 minutes. They should be lightly golden. Good served warm or cooled completely. Makes 32 Rugelakh. 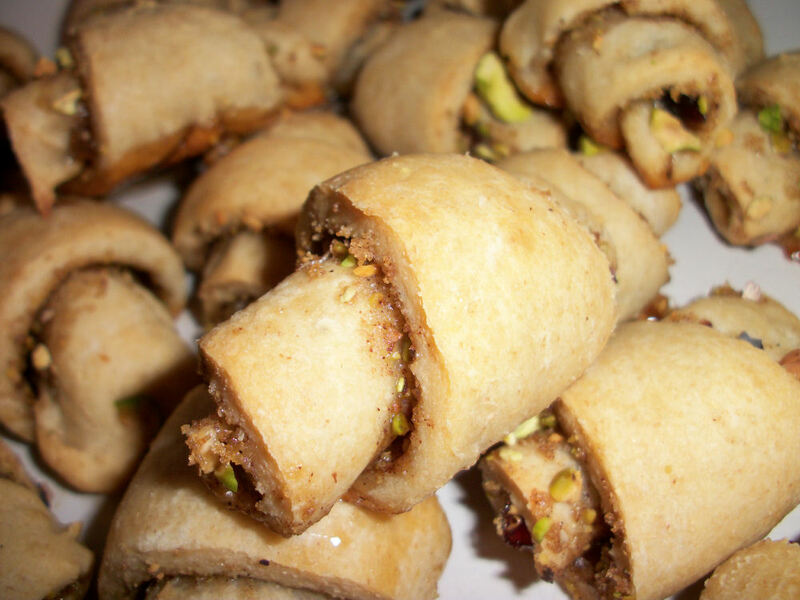 Each rugelakh contains 69 calories, 2.3 grams of fat, and .6 grams of fibre. This was calculated using splenda, add a bit more calories if you plan to use sugar. This entry was posted in Dessert, Snack and tagged Cheese, Cinnamon, cranberry, pistachio. Bookmark the permalink.